Working in isolation, health departments can only do so much to impact Maternal & Child Health (MCH) priorities. In our latest cooperative agreement with the Maternal Child Health Bureau (MCHB), we began the Collective Impact Learning Collaborative aimed at aligning state and local priorities to address MCH outcomes. Through this collaborative, local urban health departments have implemented Collective Impact strategies—engaging in multi-level, cross-sector interventions— to address one of their state’s Title V priorities at the local level. This issue features the work of some of our local collaboratives, as well as some Healthy Start grantees. 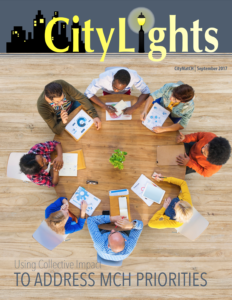 As you will read in this issue, many of our teams are finding that when they collaborate with community members and stakeholders from other sectors, they can accomplish much more together. The collaborative has challenged them to do things differently than they have before. As a result, they are cultivating fruitful partnerships with unlikely allies, developing paths to sustainability that do not rely on state or federal dollars, and making impact on their state’s Title V MCH priority.